About a year ago I posted a ‘How-To‘ document describing how to connect an AM2315 temperature sensor to a Pi. I received many emails and many people posted responses to my blog entry. One of the most interesting emails I received was from Dr. Michael Glenn, Plant Physiologist and Director of Research, at the US Department of Agriculture. Dr. Glenn was trying to solve a problem. As we all know, global warming is an important topic today. Regardless of your personal views on the subject, the only way we will ever know the true facts about the impact of a warmer earth is to study it. Dr. Glenn and his research team do just that. There continues to be great interest in hacking weather sensors on the Pi. A while ago I wrote a ‘How-To‘ for the AOSONG AM2315 temperature/humidity sensor that was quite popular. Today I have released another ‘How-To‘ for the AM2315’s siblings – the AM2302, DHT11, and DHT22 sensors. I have found that experienced Pi/Linux users can get these sensors up and running in a very short time. For many hackers new to the Pi and or Linux, it is a challenging learning process, sometimes even intimidating. Sopwith’s ‘How-To‘ series are guides designed to help these folks succeed in their Pi project. Each ‘How-To‘ includes screen shots for nearly every step of a project. Although this takes some work and makes the documents longer, I have found it is these images that help Pi enthusiasts understand each implementation step. You can download the ‘How-To‘ below. The Zip file also contains the modified test Python script described in the document. Post a comment if the ‘How-To‘ Series helps you with your projects. Improvements, edits, bug reports, and requests for other ‘How-To‘ topics are most welcome. There is a kid out there who would love to help you hack your Pi. Ol’ Sopwith was fortunate enough to order a couple of Pi 2’s before they quickly sold out. I received them on February 4th and immediately started to hack. I did not expect this news about my new Pi’s. They are very camera shy. There is a published report on the Register UK web site that the Pi 2 does not like its picture taken. It seems that Pi 2’s will crash when you take a photo of them using a Xenon flash. How crazy is this? I did what any good hacker would do – recreate the problem. I whipped out my trusty old Canon PowerShot A650 and took a picture of my Pi 2 when it was running a temperature sensor test suite. Sure enough, the instant the flash went off my little Pi went to sleep. Dead sleep. Some YouTube videos show their Pi’s rebooting, mine shutdown completely. The crash did not affect my Pi; it immediately booted fine when I cycled power. 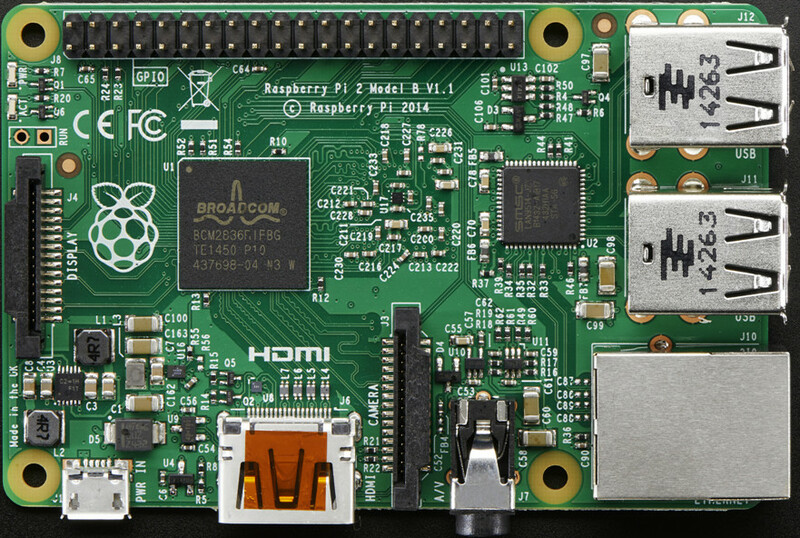 The Raspberry Pi Foundation released another new Pi last week. Officially called the Pi 2, the new changes are all about performance. The form factor is exactly the same as the B+. The big news is the use of an ARMv7 core processor that has 4 cores plus a boost of additional RAM to 1 GB. Initial reports say this Pi is 6X faster than its siblings. Wow!